← One month to go – Eeep! So, with two weeks to go until Bonnie’s Story: A Blonde’s Guide to Mathematics is released, I am starting to get out there and ‘shake my assets’ (as my husband puts it) to anyone I think would be interested in reading this fantastic eBook. On the blog itself, I’ve been updating a few of the pages. Not only has my ‘You’re Invited’ page been updated to show the Mount Barker Community Library launch on June 15th, but I’ve updated my ‘Media & Reviews’ page to show off some of those fantastic bloggers taking the time to let me know what they think. Both good and bad, as long as there is constructive criticism, I appreciate all comments. In non Bonnie’s Story news, I’ve started pitching Isis, Vampires and Ghosts – Oh My! to publishers. Surprisingly, within days of starting my pitch I received an offer of a contract by one small house publisher… and there is the strong possibility of being offered another contract by a different small publisher in the near future. As I put so much time and effort into this manuscript, I am rather chuffed at the instant interest when I am still just an ‘Emerging Author’ (AKA a no one in the literary world). And, because of this interest, I am putting myself out there and not so much shaking my assets as professionally and politely showing them to various Literary Agents in the hopes I get a nibble of interest there too. I mean, I enjoy writing and that’s why I do it. I have a small fan base as it is… but to really ‘make it’ as an author a Lit.agent is the way to go. Well, that about wraps it up for this blog post. Winter has arrived here in the Adelaide Hills with some glorious wet, cold and soggy days. Believe me, making it through our hot and dry summers with the real threat of bushfires… wet weather is just a sight for sore eyes. And just to add a little whimsy to my post, I’m including a pic of what other creative things I’ve been up to recently. Last Sunday, I made this rather piggy rich chocolate cake topped with chocolate ganache and marzipan for my Middle Horde’s birthday. 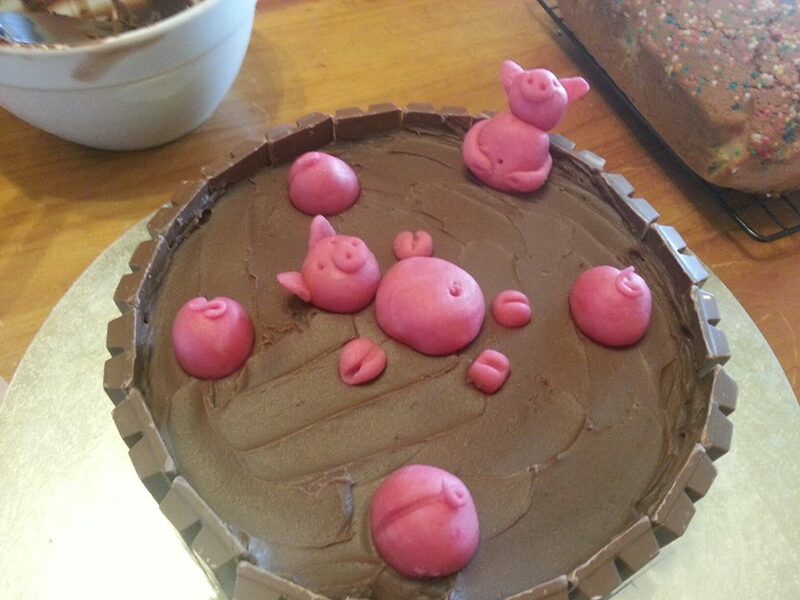 See, I can not only write, but my marzipan pig bottoms are rather cute too.